Just South of the town of Hallein and the Pass Lueg gauge (which was heavily defended against the advancing French and Bavarians by Salzburgians and Austrians in the Napoleonic Wars), the number of summer tourists suddenly drops dramatically. Salzburg is one of Europe′s most heavily visited sightseeing destinations and still there are many tourists that make it to Hallein, but a lot fewer go further south in the Salzburg province. Quite a shame, as they miss out on several attractions, such as the Fortress Hohenwerfen of the town Werfen. 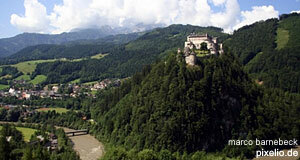 The fortress dominates the village, sitting on a cliff of bare rock in the heart of the Salzach Valley. The core of the fortress dates back to the 11th century, but there is very little preserved from these days. The reason why this location was chosen is obvious: Once you have managed to climb the cliff on which the Hohenwerfen is located, you will see how prominent the position of it is with respect to the valley - the only direct route to Salzburg could be locked from here. The chapel of the fortress is among the oldest parts of the building. Most of the outer walls were extended in 17th century under the rule of Prince Archbishop Wolf Dietrich von Raitenau. The legendary bishop that is still famed for his building obsessions (a fair part of Salzburg′s Baroque face owes its existence to Wolf Dietrich) was briefly imprisoned in Hohenwerfen by his rival and successor Prince Archbishop Markus Sittikus. Wolf Dietrich′s apartments in the fortress are still among the main attractions of Hohenwerfen. Until a few decades ago, the regional police academy was housed in the fortress. Guides sometimes tell the anecdote that one night a bunch of moderately sober cadets decided that it would a delightful idea to fire one of the 17th century cannons. They got gun powder from God knows where and managed to blow a cannon up with such an impact that several windows in Werfen down in the valley burst. Today, the more appropriate behaviours of the Austrian regional police (until very recently called "Gendarmerie" like in France) is commemorated in an exhibition inside Hohenwerfen. The other attraction is a display of birds of prey and the supposedly medieval practice of falconry. The birds give a majestic impression soaring in front of the mountain scenery and the staff is very helpful with questions from the audience. For example, you could ask from where exactly they import the birds that they cannot breed themselves and that are protected and banned from import to Austria, but not to the Netherlands, which is also a member of the European Union, which allows…well, just ask and make me biologist happy. For an interesting place to go that does not require any trade with endangered species, go to the Eisriesenwelt Ice Caves, Werfen′s second big attraction. The entrance to this largest ice cave in Austria (I might be wrong on that one, but think it is) is high above the valley and offers great views over Werfen and the Fortress Hohenwerfen. Keep in mind that "ice cave" is not just a name - even during the hottest summer days, the temperature in the ice cave does not drop and you will certainly require warm clothing to stay comfortable. Once this is sorted, you can marvel at bizarre formations of ice on a 75-minute tour in German or entertaining English on demand.